. Although support for compression is a standard feature of all modern browsers, there are still many cases in which users of these browsers do not receive compressed content. This wastes bandwidth and slows down users' interactions with web pages. Uncompressed content hurts all users. For bandwidth-constrained users, it takes longer just to transfer the additional bits. For broadband connections, even though the bits are transferred quickly, it takes several round trips between client and server before the two can communicate at the highest possible speed. For these users the number of round trips is the larger factor in determining the time required to load a web page. Even for well-connected users these round trips often take tens of milliseconds and sometimes well over one hundred milliseconds. Data, with permission, from Steve Souders, "Chapter 9: Going Beyond Gzipping," in Even Faster Web Sites (Sebastapol, CA: O'Reilly, 2009), 122. The data from Google's web search logs show that the average page load time for users getting uncompressed content is 25% higher compared to the time for users getting compressed content. In a randomized experiment where we forced compression for some users who would otherwise not get compressed content, we measured a latency improvement of 300ms. While this experiment did not capture the full difference, that is probably because users getting forced compression have older computers and older software. We have found that there are 4 major reasons why users do not get compressed content: anti-virus software, browser bugs, web proxies, and misconfigured web servers. The first three modify the web request so that the web server does not know that the browser can uncompress content. Specifically, they remove or mangle the Accept-Encoding header that is normally sent with every request. Anti-virus software may try to minimize CPU operations by intercepting and altering requests so that web servers send back uncompressed content. But if the CPU is not the bottleneck, the software is not doing users any favors. Some popular antivirus programs interfere with compression. Users can check if their anti-virus software is interfering with compression by visiting the browser compression test page at Browserscope.org. By default, Internet Explorer 6 downgrades to HTTP/1.0 when behind a proxy, and as a result does not send the Accept-Encoding request header. 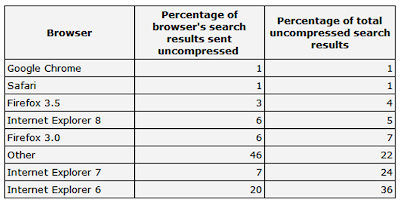 The table below, generated from Google's web search logs, shows that IE 6 represents 36% of all search results that are sent without compression. This number is far higher than the percentage of people using IE 6. There are a handful of ISPs, where the percentage of uncompressed content is over 95%. One likely hypothesis is that either an ISP or a corporate proxy removes or mangles the Accept-Encoding header. As with anti-virus software, a user who suspects an ISP is interfering with compression should visit the browser compression test page at Browserscope.org. Finally, in many cases, users are not getting compressed content because the websites they visit are not compressing their content. The following table shows a few popular websites that do not compress all of their content. If these websites were to compress their content, they could decrease the page load times by hundreds of milliseconds for the average user, and even more for users on modem connections. To reduce uncompressed content, we all need to work together. Corporate IT departments and individual users can upgrade their browsers, especially if they are using IE 6 with a proxy. Using the latest version of Firefox, Internet Explorer, Opera, Safari, or Google Chrome will increase the chances of getting compressed content. A recent editorial in IEEE Spectrum lists additional reasons - besides compression - for upgrading from IE6. Anti-virus software vendors can start handling compression properly and would need to stop removing or mangling the Accept-Encoding header in upcoming releases of their software. ISPs that use an HTTP proxy which strips or mangles the Accept-Encoding header can upgrade, reconfigure or install a better proxy which doesn't prevent their users from getting compressed content. Webmasters can use Page Speed (or other similar tools) to check that the content of their pages is compressed. For more articles on speeding up the web, check out http://code.google.com/speed/articles/. Every day, more than 99 human years are wasted because of uncompressed content. Although support for compression is a standard feature of all modern browsers, there are still many cases in which users of these browsers do not receive compressed content. This wastes bandwidth and slows down users' interactions with web pages. This encoding is really easy to implement at both sides. Libraries are freely available. It is also specially interesting for applications fetching web pages or serving heavy documents. Results are already zipped. Simple deflate (zip) would be have been more suitable than gzip. Most servers continue to serve preferably gzip for old reasons. GZIP transmits a filename (?) with the contents. I am also looking forward the time some parts of pages (like graphics) will be served as attachements reducing the number of requests. Well, Blogger users can´t modify so much their blogs to 'Speed-Up' it. The compression its so important for users. Greets for all from Bogotá, Colombia. I'm one of the inventors of mod_gzip, which is the compression module for Apache web servers. If you need it just visit Source Forge and it's available for free along with the source code. akan saya coba semoga mendapat hasil yang terbaik terimakasih..
terimakasih info yang saya dapatkan.